What you need to know to engineer the global service economy. As customers and service providers create new value through globally interconnected service enterprises, service engineers are finding new opportunities to innovate, design, and manage the service operations and processes of the new service-based economy. Introduction to Service Engineering provides the tools and information a service engineer needs to fulfill this critical new role. The book introduces engineers as well as students to the fundamentals of the theory and practice of service engineering, covering the characteristics of service enterprises, service design and operations, customer service and service quality, web-based services, and innovations in service systems. 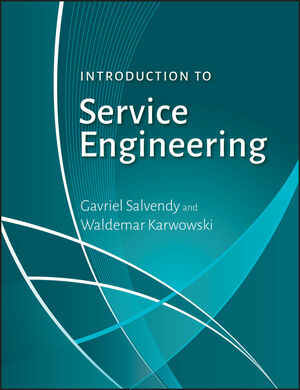 With chapters written by fifty-seven specialists and edited by bestselling authors Gavriel Salvendy and Waldemar Karwowski, Introduction to Service Engineering uses numerous examples, problems, and real-world case studies to help readers master the knowledge and the skills required to succeed in service engineering. 1 Service Science: Toward a Smarter Planet (J. Spohrer and P. P. Maglio). 2 A Unified Service Theory (S. E. Sampson). 3 Work in the Service Economy (J. Blomberg). 4 Development of Hybrid Solutions-A Challenge for Organizations in a Competitive Environment (K. J. Zink, T. Baudach, and M. Kramp). 5 Enterprise Value Creation in the Global Service Economy (A. Herman). 6 Architecture of Service Organizations (M. Cases, D. A. Bodner, and B. Mutnury). 7 Service Enterprise Modeling (Y. Yih and A. Chaturvedi). 8 Applying the Methods of Systems Engineering to Services Engineering (M. R. Mott). 9 Customer-Centered Design of Service Organizations (W. Karwowski, G. Salvendy, and T. Ahram). 10 Design of Service-Oriented Architecture (SOA) (L.-J. Zhang and F. Bernardini). 11 Design of Collaborative e-Service Systems (H. S. Ko and S. Y. Nof). 12 New Service Development Process (K. J. Kim and T. Meiren). 13 A Methodology for Designing Services: A Modeling Method, Design Method, CAD Tool, and Their Industrial Applications (T. Sakao, E. Sundin, M. Lindahl, and Y. Shimomura). 14 Service Operations and Management (S. McLaughlin). 15 A Service Perspective of Marketing, Operations, and Value Creation (M. A. Akaka, S. L. Vargo, and R. F. Lusch). 16 Service Processes (P. Lillrank). 17 Service Call Centers: Design and Operation (R. Feinberg and C. Briggs). V Customer Service and Service Quality. 18 Lean Service (F. Voehl and A. Elshennawy). 19 Designing for Service: Creating an Experience Advantage (S. Evenson and H. Dubberly). 20 Complaint Management (B. Stauss and W. Seidel). 21 Integrating Service Quality and Human Factors (C. Drury). 22 Designing Web-Based Services (N. Partarakis, C. Doulgeraki, M. Antona, and C. Stephanidis). 23 Web Service Technology (C. Pautasso). 24 The Development of Web-Based Services (N. Partarakis, C. Doulgeraki, M. Antona, and C. Stephanidis). 25 Global e-Organization (N. Dholakia and R. R. Dholakia). VII Innovation in Service Systems. 26 The Evolution of Service Engineering-Toward the Implementation of Designing Integrative Solutions (H. Luczak and G. Gudergan). 27 Managing Service Innovation (J. Tidd and F. Hull). 28 Streamlining the Delivery of Complex SOA Solutions with Global Resources (K. Ratakonda, Y.-M. Chee, D. Oppenheim, and F. Bernardini). 29 Technology Transfer Streams in Service Industry (W. M. Grudzewski and I. K. Hejduk).